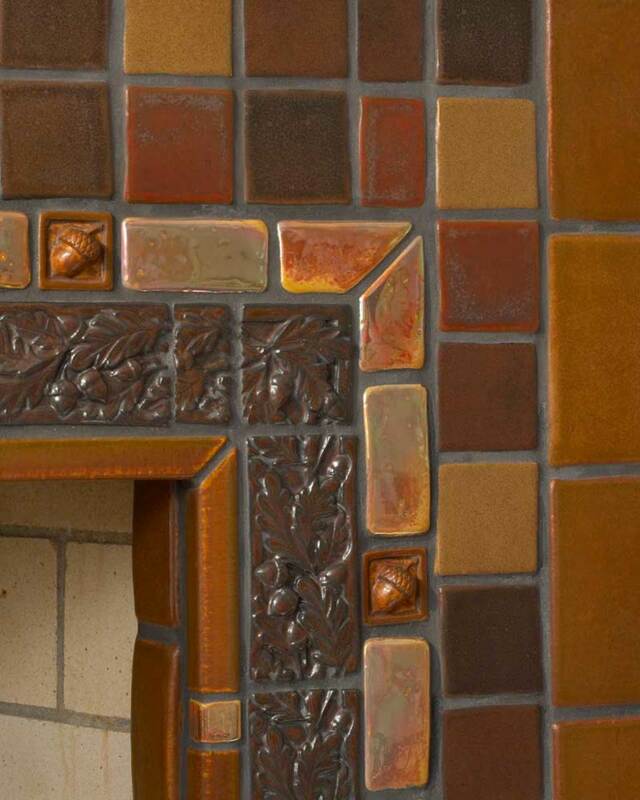 Fireplace tile surround installation by Pewabic. 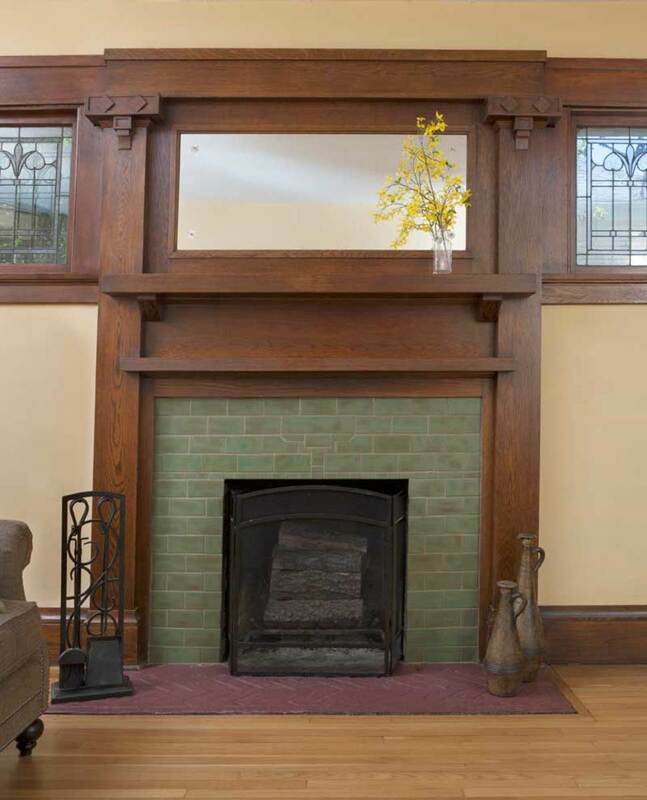 Before 1915, fireplace surrounds in both builders’ bungalows and fine Craftsman homes likely were done in brick. 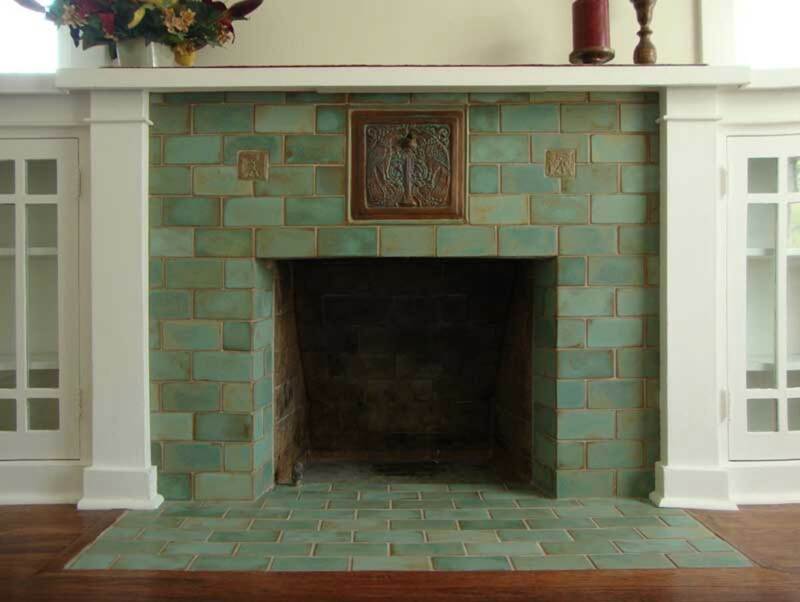 What we think of as Arts & Crafts tile really dates to the 1920s, including, for example, the work of Ernest Batchelder and tiles produced by Malibu Potteries and Catalina Clay Products. 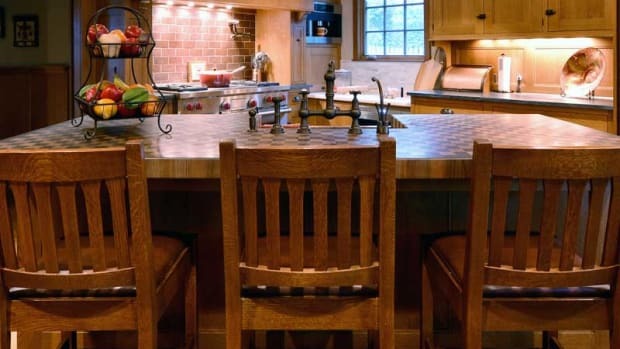 Art tile is appreciated more than ever in today’s revival, so it’s no surprise that tile is so often chosen for new work that becomes the focal point. 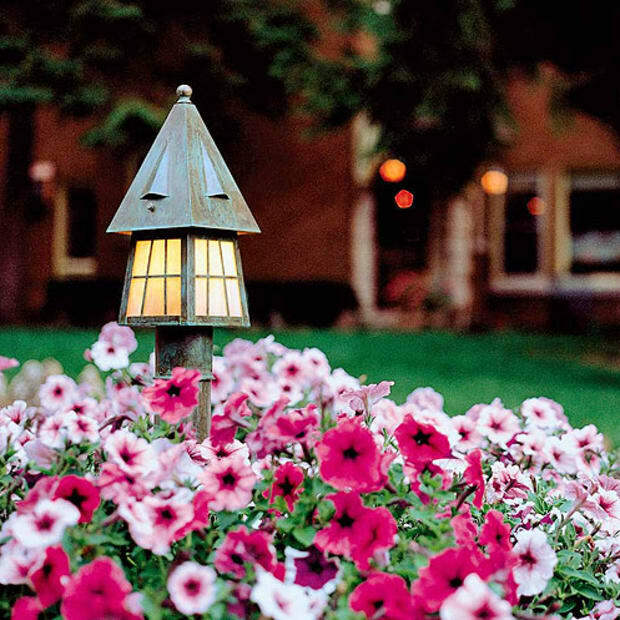 As you’ll see here, new installations run from period-correct surrounds in earthy colors to unique interpretations. 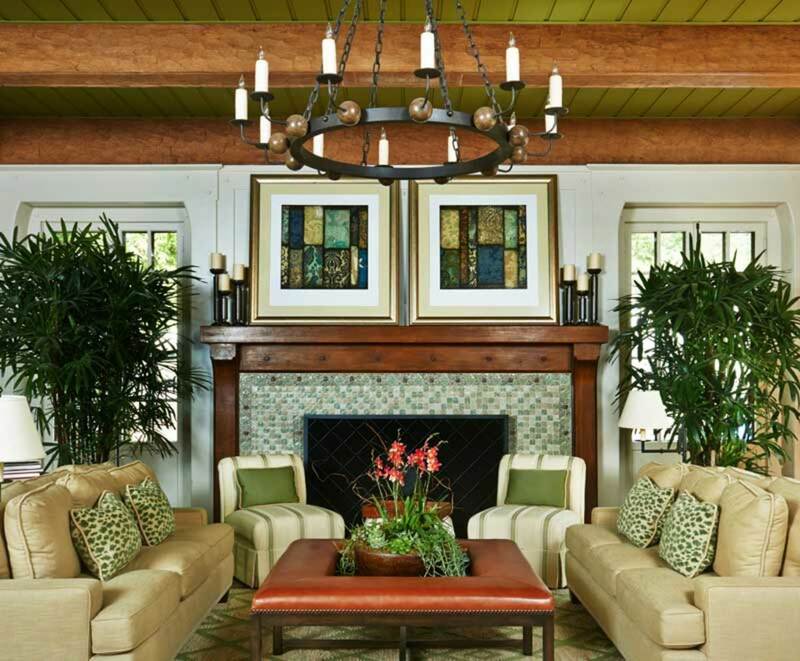 Look for nature themes, mosaics, and motifs borrowed from Greene & Greene, C.R. Mackintosh, and others. 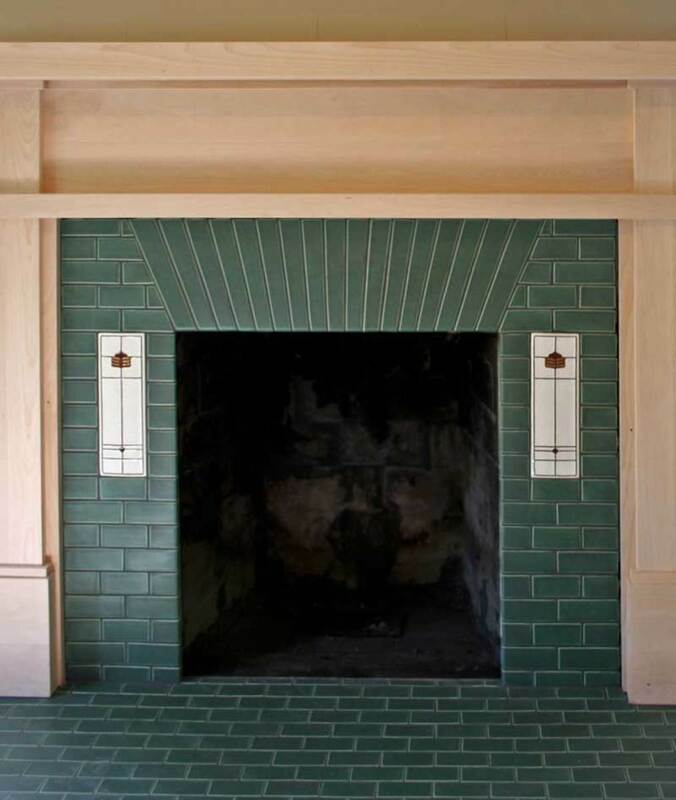 LILYWORK TILE For an English Arts & Crafts 1915 home (architect Stiles O. Clements) in Pasadena: running band ‘Iznik’ in Green Tea, Mint, Creme Brulee with 2" ‘Byzantium’ decos. Period design Kathryne Dahlman (kathrynedesigns.com). Tile for this extra- wide 10&apos; fireplace $12,000. 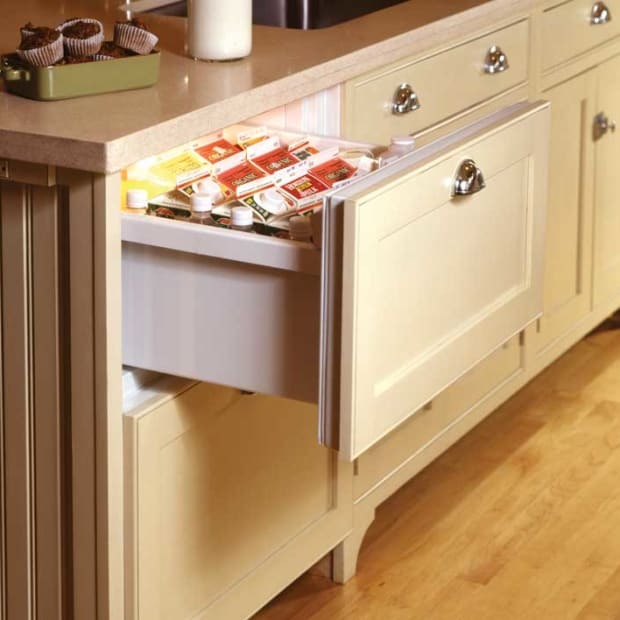 SUZANNE CRANE Remodeled for a 1969 Ranch: botanical 8" ‘Dogwood with Red Berries’ in Amber. Leaf specimens are pressed into wet clay for an impression later used as a glazing template. Handmade, no molds used. 8" tiles $85 each; this surround $1,360. 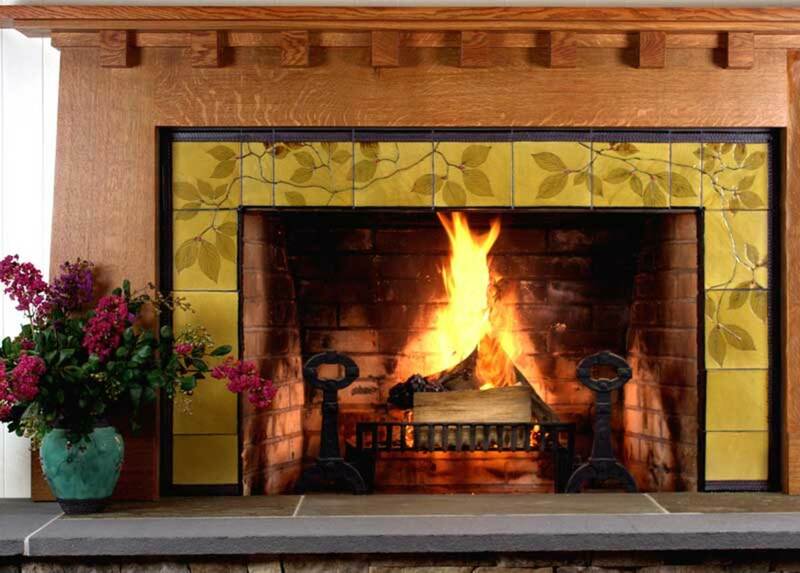 PEWABIC Tiles from the Stratton Collection in the Iroquois palette with a custom ‘Oak Leaf & Acorns’ border. Tiles approx. $5,500. NORTH PRAIRIE TILEWORKS Update for a brick bedroom fireplace of 1925. Matte Green field tiles custom fit with flaring, coved-end 2" x 12". Tube-lined ‘Prairie Blossom’ accent tiles. Tile $1,300 + $1,000 for design and sculpting. SYZYGY Recent remodel of a largely intact house in Silver City, N.M., built 1890 with additions 1908–12. 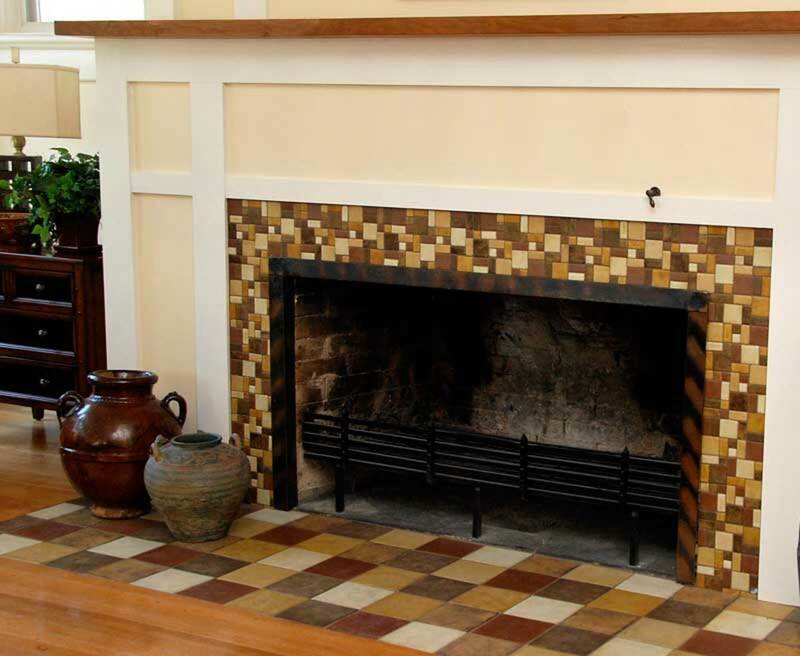 Hearth (floor) has 6" x 6" field tiles; ‘Random Blend’ pattern on the surround face, in Matte White, Brownstone, Cornsilk, Yellowstone, Wheatstone, and Acorn. Tile cost approx. $2,500. 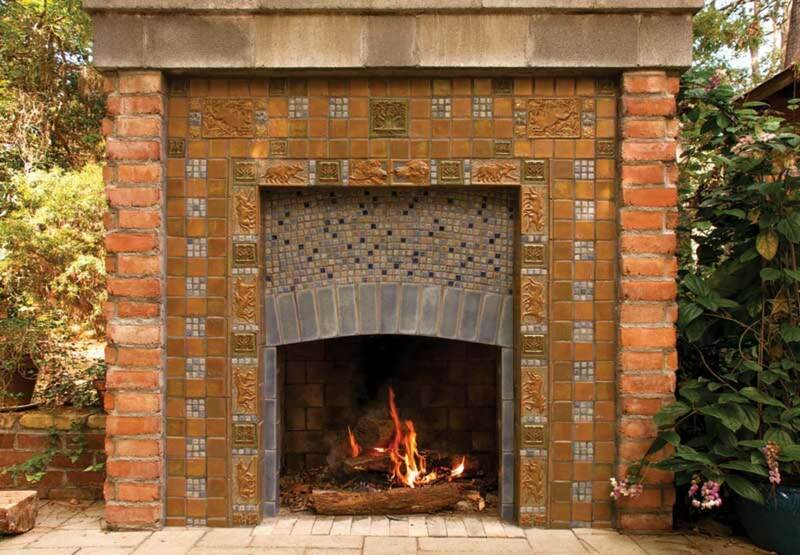 TERRA FIRMA Complex period-inspired design for a patio fireplace, with bronze-effect glazes on 3" x 3" field tiles interspersed with dog and other animal-motif tiles and mosaics. ‘Tree of Life’ center. 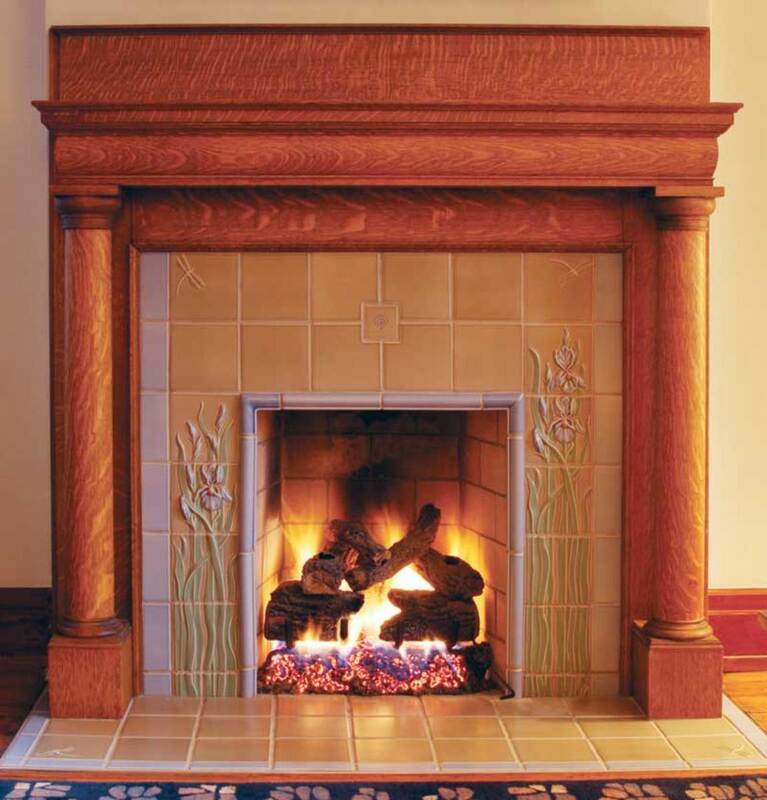 Fireplace as shown $3,000. CLAY SQUARED Laid over old brick: 3" x 6" handmade field tile in Pesto. 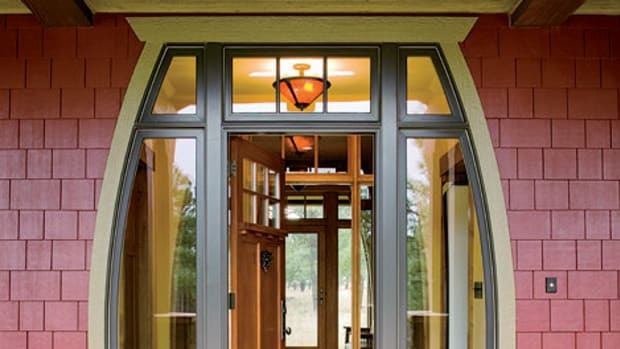 Center design cued by existing woodwork elements around mirror. Tile $650. 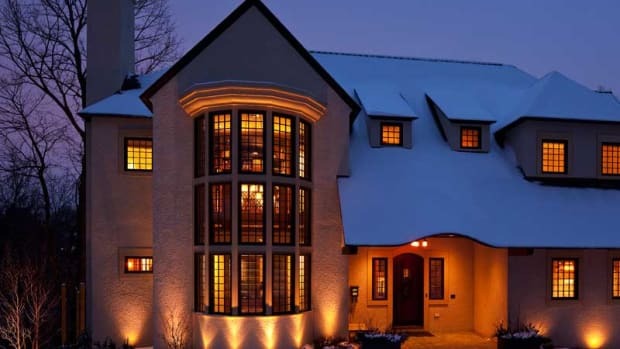 ROOKWOOD POTTERY Design by owner Jon Calderas replaced Home Depot tile in a 1908 Foursquare. ‘Chesapeake Iris’ and ‘Dragonfly’ tiles and Rookwood logo. Custom quote. 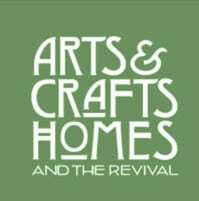 PASADENA CRAFTSMAN TILE Redo for a California Craftsman. Center 12" x 12" ‘Twin Peacocks’ tile with Dark Celadon glaze in crevices. ‘Hawks’ 3" x 3" relief tiles; 3" x 6" field tiles in Celadon. 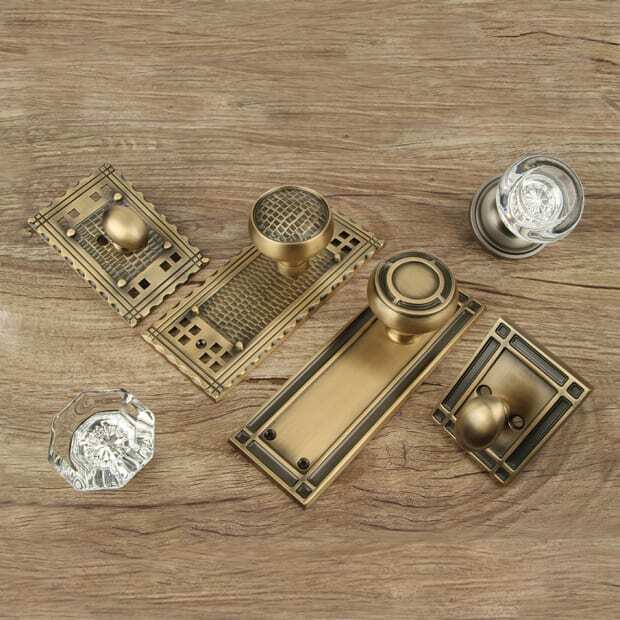 Relief patterns from impressions of original 1920s Batchelder tiles. Nice update of tradition using tile in an unpretentious brick running-bond pattern. Tile $1,600.